Some of the major companies in the global luxury hotels market are Four Seasons Holdings Inc., InterContinental Hotels Group PLC, ITC Hotels Limited, Shangri-La International Hotel Management Ltd., Starwood Hotels & Resorts, The Indian Hotels Company Limited, Mandarin Oriental International Limited, Kerzner International Resorts, Inc., Marriott International, Inc., and Jumeirah International LLC. These players are set to bolster the luxury hotels market in the years to come. According to the analysts at Zion Market Research, the global luxury hotels market was capitalized at almost USD 153.82 Billion in 2015 and is likely to cross almost USD 194.63 Billion by end of 2021, increasing at a CAGR of almost 3.5% from 2016 to 2021. “Rising trends of western lifestyles in worldwide scenario paced the requirement for luxury hotels market during business meetings and holidays,” claim analysts at Zion Market Research. As more and more users are keen in materializing their dreams of luxury living, they are investing bountifully on the same, which boosts the development of luxury hotels market. With a broad series of expectations from the realm of luxury services, users are choosing for luxury hotels and resorts over regular breakfast and bed accommodations, thereby towering the luxury hotels market. 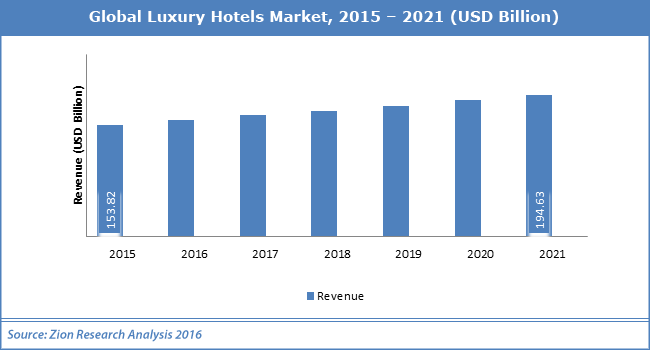 The global luxury hotels market is also being boosted by strong advertising & branding strategies implemented by hotel companies and the increasing number of global events all over the world. For example, in June 2018, Marriott International declared its transformation vision for Sheraton Hotels and Resorts. This was 3rd biggest brand in its collection, and the biggest in terms of room count outside of North America. Area-wise, luxury hotels market is divided into Europe, North America, Latin America, Asia-Pacific, and the Middle East and Africa. These areas further divided into United Kingdom, Unites States, France, Germany, Japan, China, Brazil, and India. North America was the dominating player for luxury hotels market all over the world. North America will stay the dominating player in the luxury hotels market during the forecast period due to the huge attendance of luxury hotels in the U.S. The global luxury hotels market is divided bases on geography and types. On the basis of type, luxury hotels market is divided into 5 types such as suite hotel, business hotel, resorts, airport hotel, and others. Business hotels grab the biggest share of luxury hotels market. From 2015 to 2021, this division is likely to grow with a CAGR of 3.8%. In the years to come, this division is likely to support the escalating bunch of conference groups and business travelers that are supported by a corporate budget to spend in foreign nations on living. In the meantime, the airport hotels division will grow at a steady pace of 3.7% CAGR in the years to come.